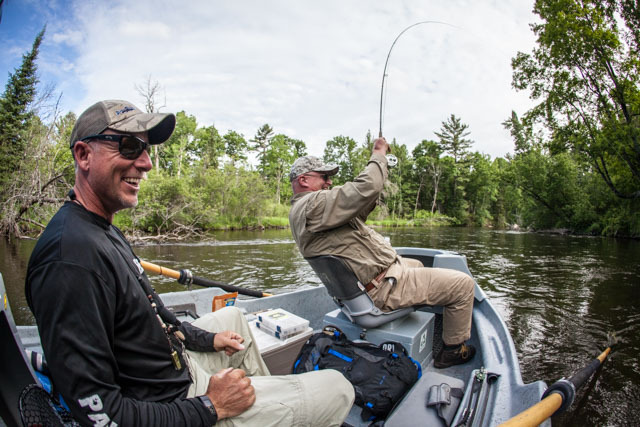 My guides and I believe in trying to control every aspect of your guided fishing trip because we can’t control weather or the fish bite. Our vehicles, boats and tackle are all meticulously maintained and of the highest quality. Our lunches excellent. Chuck Hawkins is a FFF Certified Fly Casting Instructor and most of our guides are US Coast Guard Captains. We are patient teachers and knowledgeable guides. This attention to detail and the love of what we do is why we were awarded the Orvis Endorsed Guide Service of the Year in 2010.
time of year, we may be in one of our western style drift boats, a jet sled or a smaller raft to get us into smaller waters not readily accessible. Wading trips are an option but rarely the best way to cover water. They can be great ways to run a trip focused more on learning than fish catching. Unlike many guides we truly enjoy teaching children (see our testimonial page) and have developed a variety of venues and techniques to get the younger ones into fish and more importantly into the great sport of fly fishing. Nothing makes us happier than seeing one of the “kids” continue the fishing tradition well past their teenage years. Hawkins Outfitters is not a shop or a lodge. We don’t want to be tied to one river or area or sell you equipment you don’t need. We are also happy to refer you to our lodging partners when booking a trip. My guides and I don’t have other jobs, we guide. On our days off we fish! Learning new water and/or new techniques is our lifeblood. My guides and I are some of the best in the business. While we all have different abilities and personalities our common ground is the love of guiding. Guiding and teaching our anglers to new levels of success is what motivates us to be the best we can be. Hawkins Outfitters stands ready willing and able to take you fishing on Any River…Anytime?